I know what you are thinking, and no, this post has nothing to do with raising children. What it does have to do with is finding the perfect watch. I mean THE. PERFECT. WATCH. So I have been on the hunt for the perfect watch for over a year now. I am VERY particular about these things. I have what I call "baby wrists" which means that most watches and bracelets won't fit me. So there is this issue I have with the size of the face of a watch. THEN, I wear bracelets almost every day, and when I say bracelets, as in plural, I mean I have on at least three. 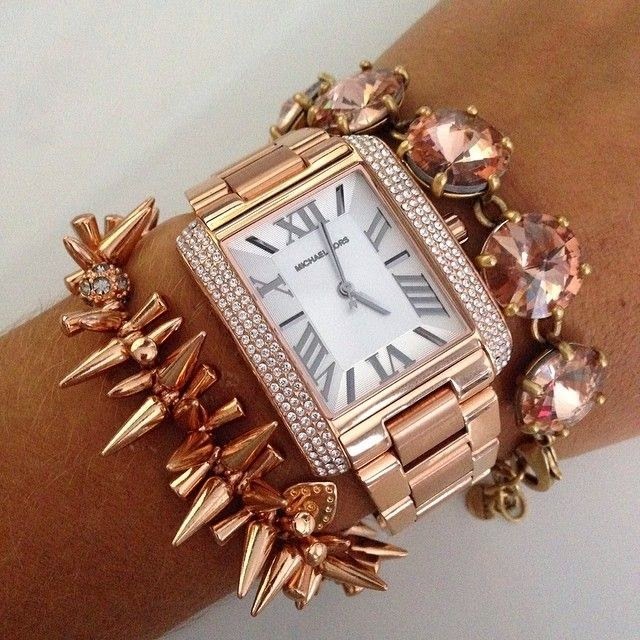 So it is essential that any watch I own go well with a good arm party. I haven't worn a watch in about 10 years (gosh I am old). I use to wear them back in the day, but then I got my cell phone and I was like, why do I need a watch? I can just check my phone? Well let me tell you why I need a watch. Now that I am a 'big kid' with a full time job, I don't walk around the office with my phone on me. And my office does not have a clock in every room, so I am constantly stressed I am going to be late to my next meeting. And if I am being honest (hangs head in shame) I am late more than I'd like to admit just because I don't know what time it is. Therefore, the solution is an awesome watch so I can be on time to places. So why is this the perfect watch? 3. It has pave crystals on the face - SQUEE!! So how did I come to find this watch? Well I was cruising through Pinterest pictures and found the photo above. I had no idea what this watch was called because the Pin links back to the Stella & Dot web page, so the only thing I had to go off was that I knew it was Michael Kors (insert panic because those tend to be expensive right??). So I did what any normal girl my age would do, I posted it to Facebook with an SOS asking my friends to help me find it. Fifteen minutes later and I had two friends who had found it on amazon and ebay, which meant I now had a style number. YAY!!! So turns out this watch is 'retired' which means you can't find it ANYWHERE. That's the bad news. The good news was that instead of being a $300 watch, it's a $118 watch since it's retired (whoop!!). So now I just had to find it. I found one on Amazon, but call me crazy - I don't really like to order on there from people who aren't actually 'Amazon' selling. I have NO IDEA what I am getting. Is it new? Is it broken? Is it a hack??? Too much uncertainty. So I called my local Michael Kors store, read them the style number, and sent them on an epic man hunt. An hour later my new best friend at Michael Kors had located them in Rhode Island. Since I live in Oregon this is REALLY FAR AWAY - but they are shipping it to me for free, so that's good. Also, one of my BFFs fell in love with it too so I ended up ordering one for her as well. She was going to order it herself, but we figured this was just easier since I had my new BFF on the phone who had two of them in his sights and was ready to place my order!! So all that said - I AM SO EXCITED TO GET MY NEW WATCH!!! Who knew one Pinterest post could spark this level of crazy obsession. Have you ever seen something online that you HAD TO HAVE so you went on a wild chase to hunt it down? ?